Waterstone Spa - Refresh. Rejuvenate. Relax. Rejuvenate in nature’s healing waters, let our experienced therapists restore you to your natural luster, and refresh your senses with the all-natural, and delightfully effective botanical products both used in our treatments, and available in our store. 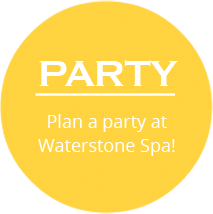 Be our guest… at Waterstone.